Life is full of shocks and traumas, from job loss to the death of a loved one. And yet, though no one escapes such pain, some do seem better able to cope. In many cases this is due to simple insensitivity. Sometimes, however, it is thanks to their emotional resilience. Without this, the consequences can be dire. Numerous cases of addiction, violence, self-harm and marriage breakdown can be traced back to the lack of such resilience. Emotional resilience, as the phrase suggests, means the ability to cope with experiences that provoke a strong emotional reaction. It does not mean having no emotions at all. The cold and callous may seem strong, but this strength is due to a lack of emotion rather than to resilience. 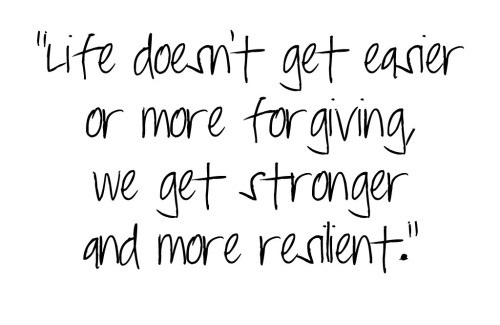 The resilient experience the same grief, fear, and heartache as anyone else; they are simply better at coping. This is often thanks to a high emotional intelligence (or E.Q., as it is sometimes known). Such intelligence is different to that of the academic. Indeed, most people know someone with a high I.Q. but low E.Q. : the sort of person who can solve difficult equations and master several languages but is utterly paralysed by stress or bereavement. Most fundamentally of all, emotional resilience depends on physical health. No matter how determined you may be, if your physical health is poor, you will find it harder to cope with emotional and psychological strain. And this has been backed by research. According to one theory, vigorous exercise forces people to withstand effects similar to those undergone during trauma. So when your heart starts pounding and you are struggling to breathe, think of it as practise. Gradually, those vulnerable to stress learn that such symptoms are no big deal. Later, when they must endure a furious boss or a trip to the hospital, they are prepared. More generally, physical health will boost your energy and lift your mood. Anyone who has been bedridden with the flu, and thus unable to exercise or eat properly, may recall the low mood, or even depression, that followed their recovery. So rule number one is get moving. Keep up a regimen of gentle, regular exercise. And make sure you eat healthily: cut the sugar and refined carbs and pack your shopping trolley with fresh, oily fish; fresh fruit and vegetables; bottles of mineral water; raw, unsalted nuts; and lean, fresh chicken and turkey. Most crucially of all, do not let this healthy regimen slip when things go wrong. When faced with bereavement, for example, people often lose their appetite, eat poorly and irregularly, and stop exercising altogether. In fact, this is the very time you should be taking most care of your body. The emotionally strong are usually realists. So always allow facts to speak for themselves and face up to the things that disturb or frustrate you. This capacity to face unpleasant truths may explain why the emotionally resilient often seem cold and clinical when a crisis occurs – but this is just an initial response. If you are going to react sensibly and effectively, whether that be to bankruptcy, debt, or infidelity, you must first get your facts straight. In other words, you must respond to reality, not fantasy. But such realism must be balanced with optimism. Instead of allowing their realism to turn them into pessimists, the emotionally resilient look for the positive in life. But they look for what is genuinely positive. Many people will claim to be “looking on the bright side” when they are in fact living in denial, or outright fantasy. So make your basic outlook one of optimistic realism. Always make a point of looking reality full in the face, and then, and only then, looking for the good side. Closely related is a willingness to face the things that frighten you. Just as optimistic realism can become a habit, so can facing your fears. Remember, the brain is “plastic”, meaning that it constantly rewires as you undergo new experiences. So every time you walk straight towards something that frightens you, allowing the fear to spike and then ebb away, you rewire the brain to associate that experience with triumph rather than pain. Being emotionally resilient means taking responsibility for your life and for your internal world. Develop a new attitude to the things you fear. You can choose to view them as traumas to be avoided or as opportunities to learn and grow. Every time you face and conquer a fear (no matter how trivial it may be), you increase your confidence, courage, and self-respect. And facing down the things that frighten you can become a habit which, in the long term, means less fear, not more. Finally, if you move towards these things your imagination will have no time to turn them into dark and terrifying monsters. Everyone, no matter how tough they may be, needs love and support. When soldiers are captured and their enemy wishes to obtain information from them, they first put them into isolation. And they do so for a reason: being isolated reduces courage and weakens the will to resist. Return that prisoner to a cell with his friends and his courage will revive. Indeed, it has been demonstrated in the laboratory that contact with other people releases oxytocin, calming both mind and body. But simply filling your life with people is not enough. What really boosts your emotional resilience is intimacy, love, and trust. In other words, you need people who care about you. Begin by re-connecting with family and friends, especially those you know to be loyal and loving. Life is so hectic that it is easy to drift away from the people who love you most. As in a marriage, your bond with family and friends needs constant maintenance. When seeking to build resilience, it can be just as important to rid yourself of old friends as to let new ones in. Distance yourself from anyone you suspect of harbouring ill-will. Such people will do nothing but reduce your resilience by eating into your confidence and self-esteem. Cut them loose and replace them with someone new. The emotionally resilient are also able to cope with change. This is due in part to their realistic view of the world. Such people recognize and accept that nothing lasts forever, including them. They know that every relationship, no matter how precious or wonderful it may be, is temporary and that the same is true of careers, looks, and health. Because of this, change does not catch them by surprise. And when it comes, they quickly accept it and try to adapt. Others bitterly resent and fear change and do all they can to escape. And when they cannot avoid it, they simply turn away and refuse to look. The emotionally resilient are flexible and open, not only accepting change in their personal life but in society generally. They know that they cannot do anything about such change and, just as importantly, that not all change is bad. Yes, the world is more crowded, and yes things move at a faster pace, but you can do nothing about the birth rate! You can, however, look for the positives: the medical advances, technological breakthroughs etc. Strengthen your emotional resilience by keeping your mind open and supple. Think of it like this: if a stream freezes over and stops moving, what happens when pressure is applied to its surface? It splinters and shatters. Try not to cling stubbornly to old ways of seeing and doing things: be an eternal student, forever open to new ideas and new ways of viewing the world. Do not become one of those monsters who spends the second half of his life telling the young that everything was better 40 years ago. It wasn’t. So be realistic, flexible and open to change. Whenever possible, see the positive and find a way of adapting. And, perhaps most important of all, keep a sense of humor!